'La Bayadère is one of the jewel’s of classical ballet and an essential part of the repertoire of the world’s major ballet companies. Mounting such a large-scale work – one of the most complex and difficult ballets to perform in the repertoire – is a herculean task. This nineteenth century classic challenges the entire company, both the principal dancers – required to be spectacular and delicate by turns – and the corps de ballet – who must be completely at ease with the technically demanding choreography. Corella Ballet’s corps managed to get through the opening night but needed greater technical security and were not always well synchronized. This is still a young corps, requiring time and greater experience to move as one body and with greater aplomb. In general, there is a certain stylistic diversity within the group and the technical level is not all that it could be. The result was a competently danced Bayadere that was saved by its principal dancers: the exceptional and volatile Alina Cojocaru, completely immersed in the role of Nikiya – always noble but never arrogant – and who displayed her exceptional technical and interpretative gifts throughout the evening. With her crystalline technique, pure line and exceptional plasticity, Cojocaru is a ballerina to be treasured. She was partnered by the powerful Corella; with his enormous jumps, dazzling turns and the sheer force of his personality, this Madrid-born dancer reminded us of just why he has been able to create and lead this fledgling ballet company. Most of the applause in the jam-packed Liceu – sold out long in advance – was for these two marvellous dancers. Makarova’s version eschews the somewhat frenetic basket variation in Nikiya’s first act solo but even without it the temple dancer’s lament and death – highly dramatic and exquisitely touching as danced by Cojocaru – was one of the climaxes of the evening. Worthy of mention was Yerlan Andagulov, a powerful High Brahmin, who gave a tremendous performance. Energetic and highly convincing, this dancer, who was trained in Kazakhstan and Germany, was able to make the action clear at each turn of the plot. As Gamzatti, Adiarys Almeida gave a measured and dignified account of the role. Easily able to whip off multiple pirouettes, the daunting choreography held no terrors for this technically powerful Cuban dancer. She has yet to make the role of the Raj’s daughter fully her own, but with greater mastery of the stage and technical refinement, Almeida will surely be able to deepen her characterization. The best known company members, such as Fernando Bufala – a perfect Bronze Idol – and the female soloists María José Sales, Kazuko Omori, Cristina Casa and Ashley Ellis, were technically in command of their solos and generally carried the somewhat insecure corps de ballet throughout the evening, especially in the Act I, scene 3 variations to celebrate Gamzatti and Solor’s engagement and in the Shades’ solos in the second act. The most keenly awaited moment was the Shades’ entrance, descending a ramp, at the beginning of the second act. At its best, this is one of the most magical moments in the repertoire and Corella’s corps acquitted themselves admirably. The few wrong port de bras and trembling balances were probably due to first-night nerves. The three soloists, Sales, Omori and Ellis were superb in the three variations and, together with Cojocaru and Corella, filled the theater with their artistry. The role of Aya, a key figure in the ballet’s plot, fell flat in the hands of a young and completely inexpressive dancer. 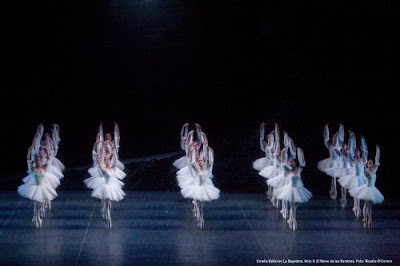 The result was a poor shadow of a performance, especially given the memory of Karemia Moreno in this role at the first night of the Corella Ballet in 2008 in Madrid’s Teatro Real. Moreno’s Aya was a perceptive servant who blazoned with dramatic power.